Proprietary Name: Ultra Vedic What is the Proprietary Name? Non-Proprietary Name: Feminine Pain Relief What is the Non-Proprietary Name? Ultra Vedic with NDC 72625-130 is a a human over the counter drug product labeled by Pharmaneek, Inc.. 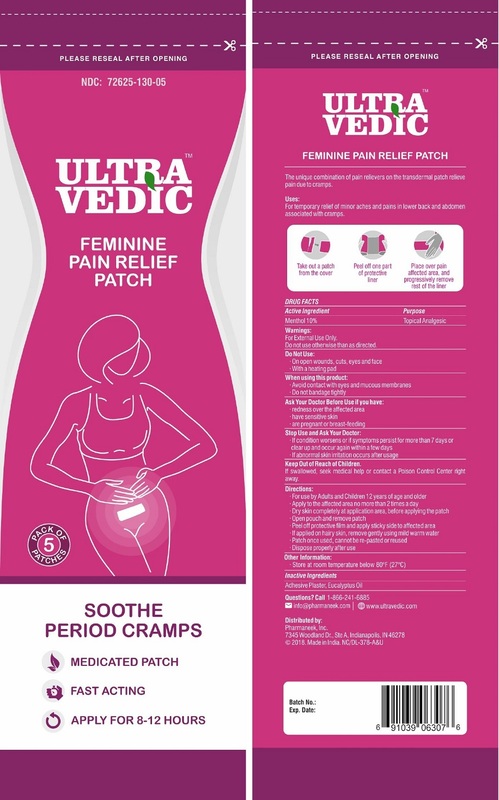 The generic name of Ultra Vedic is feminine pain relief. The product's dosage form is patch and is administered via topical form. For temporary relief of minor aches and pains in lower back and abdomen associated with cramps. For External Use OnlyDo not use otherwise than as directed. If swallowed, seek medical help or contact a Poison Control Center right away.